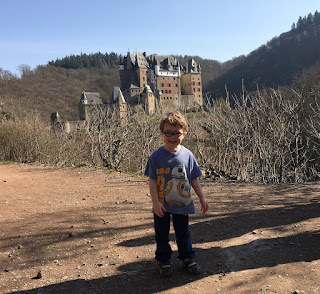 It seems a shame I have lived in Germany over a year and haven't written about Burg Eltz. Why did it take me so long to visit the castle? What was I doing last summer? Eltz is probably one of my favorite sights near my house; it's my new Number 1 sightseeing spot to take family to when they come to visit. Hopefully, my pictures will explain why. 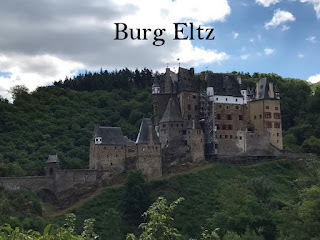 Burg Eltz is only 45 minutes to 1 hour away from where I live, and it's a fairly easy sight to reach. The majority of the trek is on the autobahn, with the last half hour winding you through picturesque villages and through mountain roads. One path - the K35 - feels like you're cutting through some farmer's field. 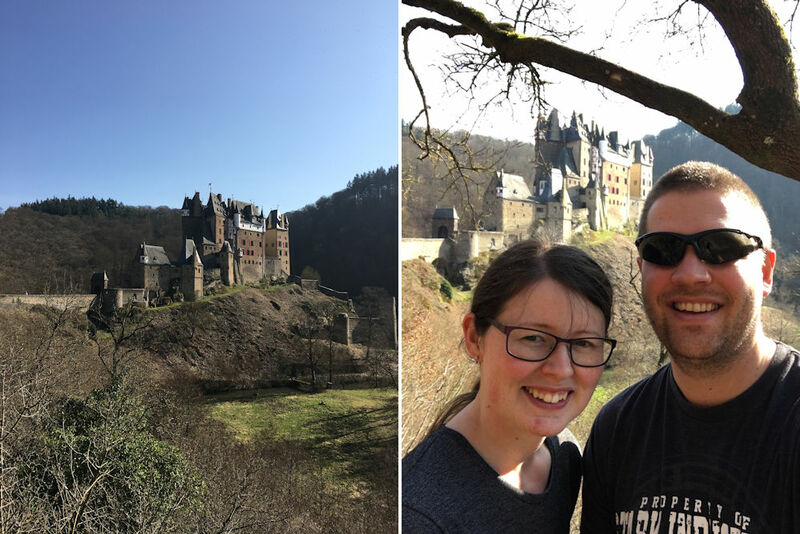 It was a narrow, one lane road in the middle of nowhere that I swore we weren't supposed to be on the first time we visited Eltz. I continuously looked out my window waiting for an angry citizen to shoo us off his land. 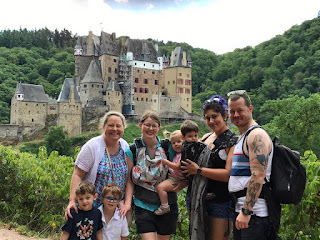 The first time I visited Eltz was back in March with Alex, my sister in-law, and her boyfriend. The place remains closed for the winter season, so that visit consisted primarily of us hiking and taking in the outer facade. During the open season, you pay 2 Euro to park and have the option of taking a 2 Euro shuttle to the entrance, walking the steep road that the shuttle uses, or using the one mile footpath through the woods. Now, I've been writing in this blog for over a year. You all probably know me pretty well, which means you are all aware that I'm not a huge fan of the woods. It's not my cup of tea. However, if you're going to see Burg Eltz, the footpath is the way to go. The path is easy to follow, flat enough my 20 month old could walk on it assisted, and shaded from direct sunlight throughout most of the way. The reason I recommend this path is because once you round a corner, you are provided with a stunning view of the castle down below. Its grandeur almost slaps you in the face due to it seeming so out of place. You're in the middle of nowhere, trekking through dirt and trees and then WHAM! There's an ancient castle plopped down beside a stream, set back from rock cliffs. In my opinion, the best photo location is from far back on the path. You get the whole castle in the frame and capture the feel of the spot more so than in front of the front gates. My mother is back in Germany visiting for a few weeks (AKA: making sure I stay sane with Alex gone) and my brother and his family made plans to meet up with me and tour Burg Eltz. There was myself and my two kids, my mom, my older brother and his wife and their two boys. Eight people in total. Four of them under the age 5. What a crazy band of travelers we made. The two groups met in the parking lot around 10:30 a.m. and at my insistence, we walked via the footpath to the castle. A nice English woman whom we had met by the cars stopped and chatted with us again at that corner I love so much and agreed to take a photo of everyone together. I love when everyone is in the shot together; it's such a rare treat when vacationing, because typically someone has to take the photo. This time around, the castle was open to the public and offered an English tour. 10 Euro for adults, free for kids. 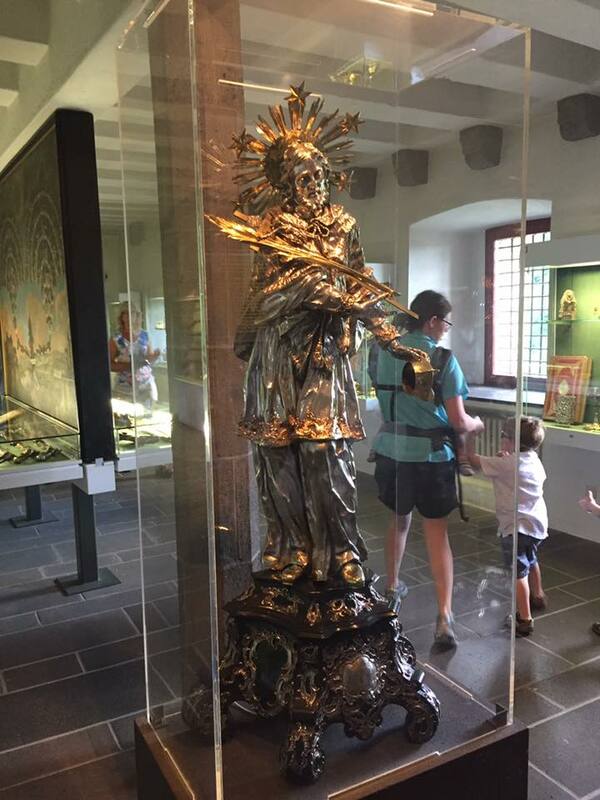 You weren't allowed to take photos or videos during the tour, so I have no pictures from that part of the day, but I can say it was a worthwhile experience. My brother felt it was a tad overpriced for what we got, but honestly...any tour that has an English option is worth it to me. I was just grateful to understand what was being said! In the tapestries in one of the rooms, the animals that were depicted looked like fantasy creatures. The artists were going off of stories told from other people and having never actually seen the creatures themselves, they came up with some pretty unique interpretations. One of the rooms we were taken into was called the Knight's Hall. 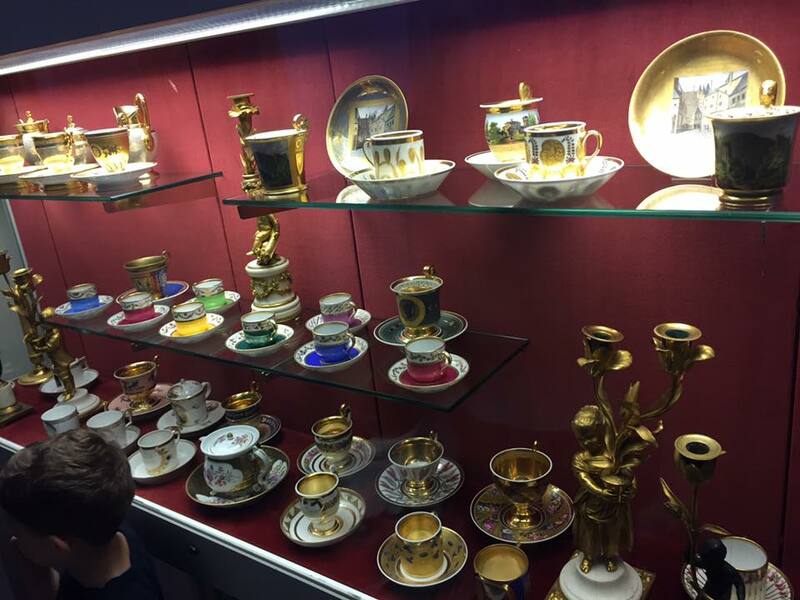 This part of the tour was big with my family. Evie loved the moose head on the wall from 1907 Alaska. Landon got a kick out seeing one of the two massive fireplaces in the room, as well as seeing a "real life treasure chest." This sucker had an intricate lock system and could be screwed into the ground if necessary. Who needs safety deposit boxes when you've got an immovable oak chest weighing a couple hundred pounds after you stored all your gold in it? Hanging from the walls were shields with the symbol of silence on them, because the room was used for political meetings and important gatherings. The rule of thumb was that whatever was spoken in the room, stayed in there. There was also a jester's mask on the center wall to represent freedom of speech. What amused me most throughout the tour was the reminder of how short people used to be! Suits of armor, doorways, I even mistook a bed for child's version because it was so small...all little clues as to how I would have been considered tall back in the day. Poor Alex would have been gigantic. The last room of the tour was the kitchen, where I got to peek at a midevil sink. Calling it a sink by modern standards was a bit of a stretch; it more closely resembled a slap of concrete with a two inch depression in the counter. However, from about the 16th Century on if there was rain water to be had, the sink could easily be used. If there was no water, a serveant had to go down to the river and collect water to use. To which my response was: "The dishes would've stayed dirty." Then again, at least they had those "modern novelties." Heck, in one of the bedrooms we visited, someone had installed a private toilet in the 1500's. Complete with a door and everything. 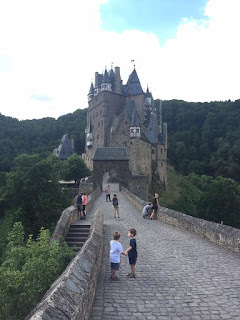 If I accidentally stepped through a stone circle and time traveled to the 16th Century, I can only hope I would land in a thrifty place like Eltz. But we all know that's impossible. 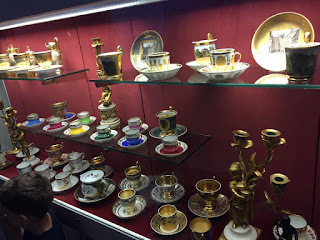 Once the official tour was complete, we were free to look around the treasury and take a gander at the novelties the Eltz family had collected over the years. My sister in-law grabbed a few shots in these rooms, so I promptly stole them for this update. By the time my group had finished with the tour and the treasury, it was nearing one o'clock. Fortunately, there was a cafe near the entrance and everyone filled up on lunch fare. After that, it was a backward circuit through the woods until we reached our vehicles. I have to say, the four kids did amazingly well during the tour. The older boys got restless a few times and wanted to jump in place or grab the partitioning ropes, but a quick warning from me or my brother and they knocked it off. Landon's cousin wanted to hold his hand the entire time, which really helped in keeping track of them. You only needed to look for one to find the other. There were some snafu moments on the stairs when the kids didn't understand why they had to hold on to the handrails rather than each other. Most of the cases were spirals with narrow widths and steep steps, so both adults and boys alike had to concentrate fully on not breaking a neck. My family is pretty fortunate in that we have gotten to do as many family gatherings as we have. When you get orders overseas, you never really know what that means in terms of visiting relatives, but Alex and I have lucked out tremendously. My mother has gone to Disneyland Paris with us and has now sight-seen around Germany (she went to the famous Neuschwanstein Castle with my bro....something I'm very jealous of!). Alex's parents and sister have gone to Rome with us, and my sibling and his family live an hour's drive away. If you had told me after I married a military guy that my kids would get the chance to grow up with their cousins- even for a short period of time -I'd have said you were nuts. But life is crazy and here we are. 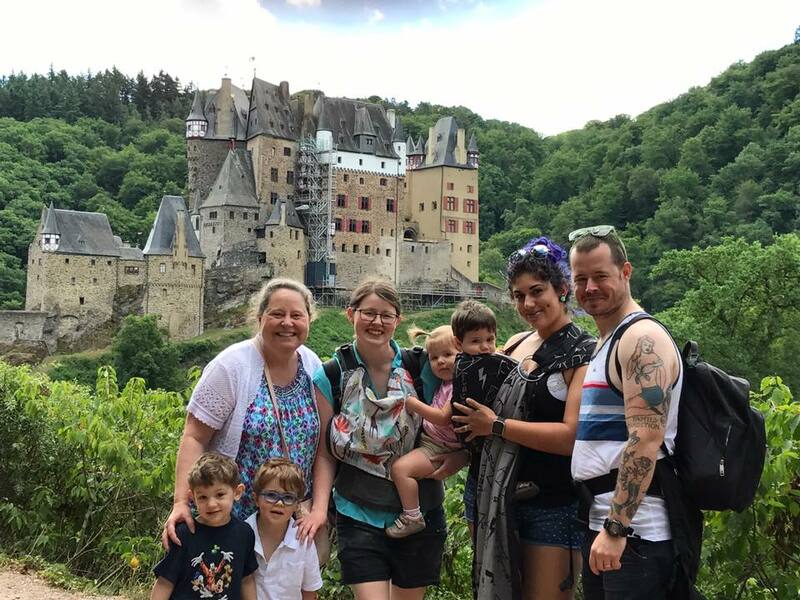 My son and nephew holding hands at a German castle while my daughter and second nephew share toothy grins in their mother's arms. I can only hope our two families get the opportunity to create more memories together before one of us leaves this amazing place.